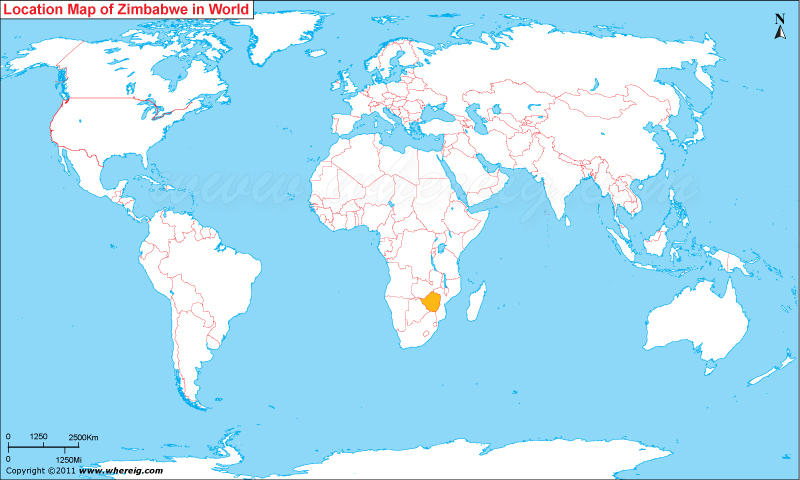 About Map: Map showing where is Zimbabwe located in the World. The given Zimbabwe location map shows that Zimbabwe is located in the southern part of Africa continent. Zimbabwe map also shows that Zimbabwe is a landlocked country that shares its international boundaries with Mozambique in the east and north-east, Zambia in the north, Namibia in the north-west, Botswana in the west, and South Africa in the south. Interestingly, Zimbabwe was formerly known with the names of Southern Rhodesia, Rhodesia, the Republic of Rhodesia, and Zimbabwe Rhodesia. The country got its independence in the year 1980. The government type of Zimbabwe is a semi-presidential system republic, under which it has a parliamentary government. Zimbabwe African National Union – Patriotic Front (commonly abbreviated ZANU-PF) headed by the President Robert Mugabe's has been the dominant political party in Zimbabwe since its independence. The economy of Zimbabwe is largely depends upon mineral exports, agriculture, and tourism. However, among them the mining sector is very lucrative, with some of the world's largest platinum reserves being mined by Anglo-American and Impala Platinum in the country. The tourists’ attractions in Zimbabwe are Victoria Falls on the Zambezi River; it is being shared with Zambia, are located in the North West of Zimbabwe; The Victoria Falls National Park and Hwange National Park.